The PE4220 SPDT Switch is designed to cover a broad range of applications from DC to 2.5 GHz. This single-supply Switch integrates on-board CMOS control Logic driven by a simple, single-pin CMOS or TTL compatible control input. Using a nominal +3-volt power supply, a typical input 1 dB compression point of +22 dBm CAN be achieved. The PE4220 also exhibits input-output isolation of better than 37 dB at 1.0 GHz and is offered in a small 8-lead MSOP package. 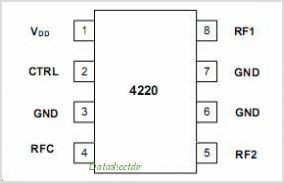 This is one package pinout of PE4220,If you need more pinouts please download PE4220's pdf datasheet. 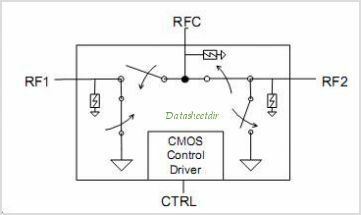 This is one application circuit of PE4220,If you need more circuits,please download PE4220's pdf datasheet.